This is situated on the west bank of river Hugli, in the premises of Belur Math. This is originally a bathing ghat popularly known as Shri Mayer Ghat. Originally, this massive brick structure consists of 30 steps, the total length being 15 m. and width 6.9 m. These steps are of bricks laid with lime mortar, constructed around 140 years ago. 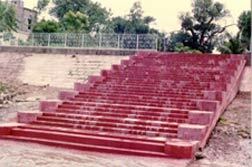 Holy Mother Saradamoni Devi used to sit here on the steps of the ghat regularly and thus it became a holy place.